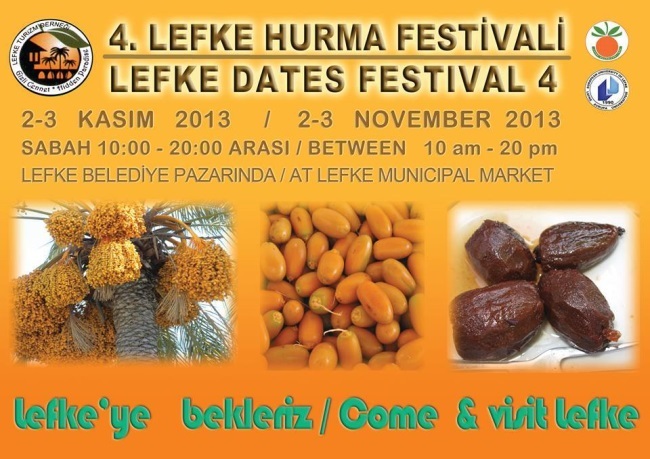 Saturday and Sunday the 2nd and 3rd November at the Lefke Municipal Market. You can visit the festival between 10am and 8pm on both days where there will be stalls selling handicrafts and local foodstuffs as well as many other items and lots of music and dancing throughout the day. If anyone would like to have a stall or to perform at the festival please register through: Nermin Saleem: 0542-8687617 or Yolaç Corporal: 0533 888 72 71. This will be a lovely time of the year to visit a festival, where there will be lots to see and enjoy. Thank you,there will be Dates Tour in the town at 12:00 o’clock on both days,our English speaking guides will show the date trees to the visitors. Meeting at Festival Area. Thank you. I will include this information in our Events Calendar. Hope to be there.